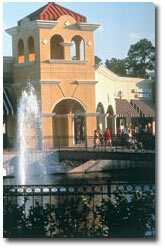 Lake Buena Vista Factory Stores located just over 1 mile from Walt Disney World. Our expansion is complete and we are Bigger & Better than ever! Experience relaxed shopping with store front parking. Select from over 300 designer and name brands. Stores offer factory direct, quality merchandise at savings up to 75%. World of Coffee and Reese's Food Court offer specialty coffees, desserts and a wide selection of favorite food items. Take advantage of our FREE scheduled shopping shuttle to and from 49 participating area hotels.